One of the key elements at CERAM is researching and keeping up to date with all different techniques that can be used in assisted reproduction treatments. These techniques helps us improve success rates but it is very important to study in detail each case to make sure that the best technique is used for each couple in the search for a successful pregnancy. In the following section you will find some details of the techniques that we used, including a description of each technique and an explanation of when it is used. If you have doubts about any technique you can contact us by phone and we will be happy to describe in more detail how the technique works. ICSI is the most common assisted reproduction nowadays. It’s a technique recommended for the following treatments: IVF (in vitro fertilization), embryo donor, egg donor, sperm donor. This technique improves the success rate and possibilities of pregnancy. The best spermatozoids and the best eggs are selected in the laboratory. Each individual spermatozoid is inyected one by one inside a mature egg. The remaining embryos are placed in the uterus just like in a traditional IVF or they are vitrified. When talking about pregnancy rate we must take into account factors like age or number of embryos transfered. Currently at CERAM when using IVF with the injection intra-cytopasmatic of spermatozoids (ICSI) the average success rate it 67%. CERAM was one of the first clinics to incorporate IMSI to their assisted reproduction laboratory. The IMSI technique (Intracytoplasmic morphologically-selected sperm injection) can greatly improve the pregnancy success rate. In the IMSI, the man’s sperm sample is examined under a microscope which multiplies the image of individual sperm up to 6000 times (although sometimes it may increase a bit more). , having more chances to develop properly in the uterus. This makes possible to discard sperm whose nuclei have an abnormal shape or contents and therefore less likely to produce a healthy embryo. Only the sperm with good genetic characteristics is selected with the IMSI microscope. The selected spermatozoids are fertilized one by one in the eggs using the ICSI technique, improving by about 15% the success rate for pregnancy. 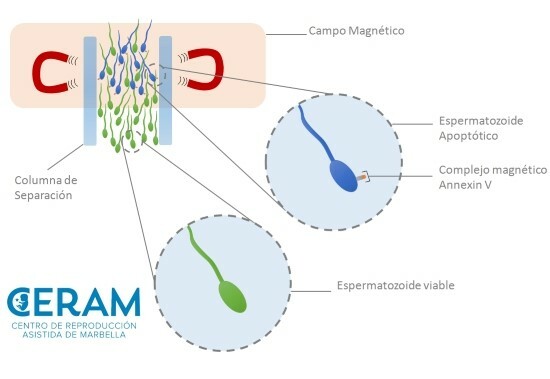 At CERAM we were also one of the first clinics in Costa del Sol to start using the latest technique in assisted reproduction, which consists of classifying and separating magnetically spermatozoids. DNA fragmentation has proved as an important technique for diagnosis and as a fundamental test to explain the causes of infertility in cases where the sperm sample has a “normal” movility and morphology. Many studies point out that the causes fragmentation are related mainly to the build up of oxidative species. Currently the studies are working on an antioxidant treatment but the results have not shown the desired effectivity yet. Meanwhile, a technique to avoid this problem has been developed and this increases the possibilities of selecting healthy and viable spermatozoids for an ICSI/IMSI treatment. Apoptosis is a biochemical process related to high values of fragmentated DNA. Annexin V recognizes an antigen (externalized phosphatidylserine, EPS) which is stored in the membrane’s plasma of apoptotic cells. Marking the apoptopic spermatozoids with the magnetic complex of Annexin V and using the classification and magnetic separation of activated cells technique (MACS) we are able to separate spermatozoids with apoptosis from those who are healthy. The marked cells are passed through a separating column placed in a magnetic field. Those cells which are not good stay in the column and those spermatozoids which are alive and haven’t been maked by the reactive substrate pass through the column and are collected to use in the treatment (Fig.1). The enriched spermatozoids generally show a better quality in terms of morphology, movility, DNA fragmentation, apoptosis, survival and fertility potential. Approximately 20% of infertility cases are caused by a masculine factor, but this factor is also present in another 30%-40% of mixed factors diagnosed. Testicular biopsy can be used when no spermatozoids are seen in the sperm sample, either for pathological reasons or when a vasectomy has been done. It consists extracting sperm directly form the testicles by surgery. It is usually a day surgery done under general or local anaesthetic, which lasts approximately 20 minutes. Who is recommended to use surgical sperm retrieval? In certain cases the spermatozoids might need to be collected from the epididimous or testicle using one of the surgicall techniques of sperm collection (PESA, TESA). The technique used will depend on the cause of the lack of spermatozoids in sperm sample. Is a very simple and painless procedure. A thin needle is inserted through the scrotum into the epididymis and seminal fluid is obtained by gentle aspiration. Then the fluid will be transferred to the laboratory to analyze the content and quality of sperm. 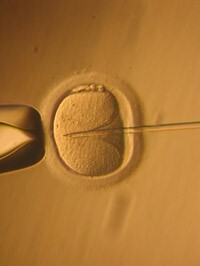 The Preimplantation Genetic Diagnosis or PGD is a technique consisting in obtaining embryos with “In Vitro Fertilization”. Then, once reaching the 8 cell stage, 1 or 2 cells are screened for a specific disease using molecular genetic techniques. From the results of this analysis, the normal embryos that don’t show cromosomic anomalies or genetic mutations will be selected for transfer after 1 or 2 days. When do we recommend PGD? It can be done both in IVF and ICSI treatments and consists in the embryos been grown in culture for five to six days. This way the best embryos are selected for the transfer. This is a common technique used in assisted reproduction, for IVF and ICSI treatments. It consists in extending the culture of embryos in the laboratory until the fifth or sixth day and this allows us to select even better the embryos to transfer. This culture is recommended only when there are many embryos because the pregnancy rate increases 10%-20% from a normal day 3 transfer. Assited hatching (or assisted eclosion) is a technique consisting in making a small opening in the outer shell that protects the embryo, to help the embryo to break trough and attach to the uterus. When do we recommend assisted hatching? The vitrification technique consists in freezing eggs or embryos instantaneously. The eggs or embryos are frozen under controlled conditions and conserved in liquid nitrogen at low temperatures (-196 º C) in a long term storage tank. Once the embryos have been vitrified, they can be stored in for many years before being thawed and used for further treatments. It is commen that in fertility treatments like IVF, ICSI or egg donation, there are more embryos generated than needed. In 50% of the cases this embryos have a good quality for them to be freezed and conserved for future use. The use of vitrified embryos is less invasive for the woman than planning a new cycle of IVF. Also, embryo freezing can reduce the number of multiple births and offers more flexibility to the couples in family planning. Before vitrifying (frozen) the remaining good quality embryos, our embryologists at CERAM will let them reach the blastocyst stage; that guarantees a very high percentage of survival after the thaw. When do we recommend egg or embryo vitrification? The Clinic for Assisted Reproduction Center in Marbella was founded in 1993 and since then we have grown together with our national patients in Spain and IVF abroad patients.